The CPID and the Portland Opera teamed up to create an innovative way to reach out to new opera audiences and communities in the Portland metro area: Opera a la Cart. 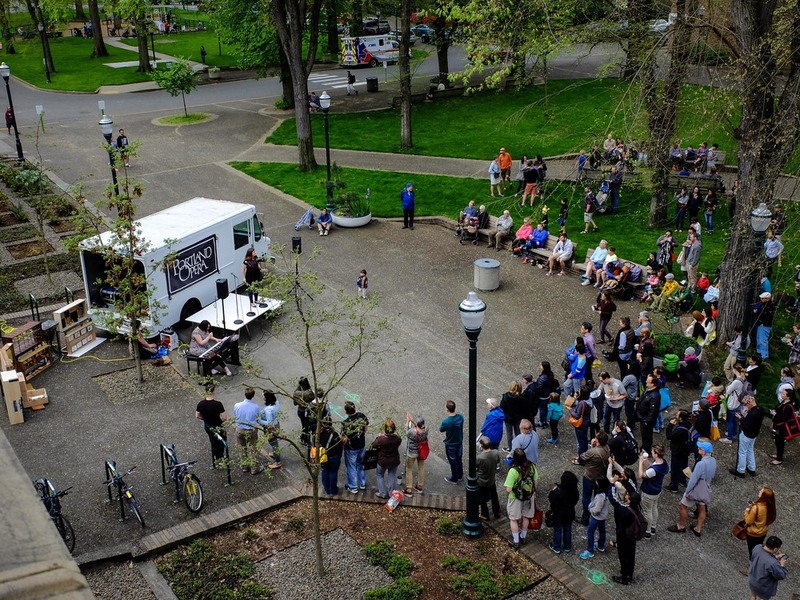 Inspired by Portland’s celebrated food-cart culture, faculty member Todd Ferry, with students in the School of Architecture and Center for Public Interest Design, took a standard box truck provided by the Portland Opera, combined it with the idea of Portland's popular food carts, and designed a moveable performance cart, which the opera company is using to deliver pop-up performances in communities all over the city. 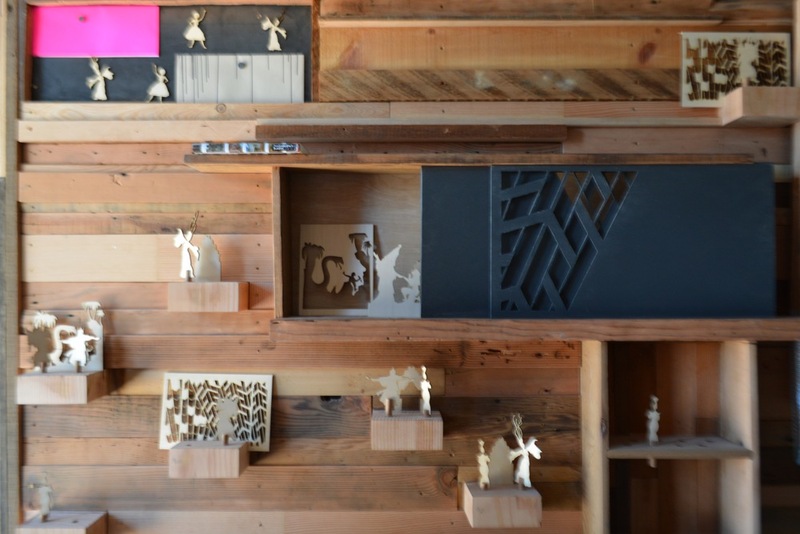 The CPID was excited to collaborate with the Opera on this project, because it explored how design could support a local cultural organization while expanding arts programming in communities throughout Portland. 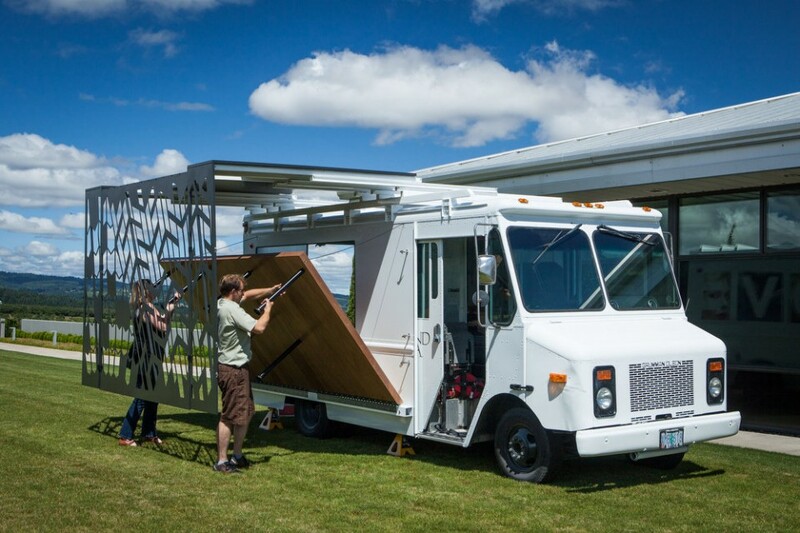 The project team made a series of provocative, functional modifications to both the interior and exterior of a formerly ordinary Grumman Olson truck. The architectural alterations include a fold-out stage, a telescoping overhead shelter and vertical columns that suggest a proscenium arch, and storage for set pieces. The venue also includes an interactive interior wall made from reclaimed materials that will allow visitors to engage and learn more about elements of the opera, such as set design, music, costumes, story-telling, etc. as programming develops in the future. The CPID team built this interior feature, and worked closely with the fabricators at Figure Plant who helped bring the exterior components of the design into a reality. CPID and the Portland Opera were awarded the 2017 Regional Arts & Culture Council Innovative Partnership Award for their collaboration on Opera a la Cart. With an emphasis on exploring how this mobile performance venue might best reach underserved communities that might not otherwise get to experience opera or its associated arts, the CPID conducted a series of pop-up performances in Portland communities where the CPID has been active on other projects: Gateway, Cully, Rosewood, and PSU. Three opera singers accompanied the truck that was to be transformed to these four locations to try different arrangement scenarios and get feedback on how the truck might be most useful and well-received in communities that often have limited access to the arts, let alone opera. 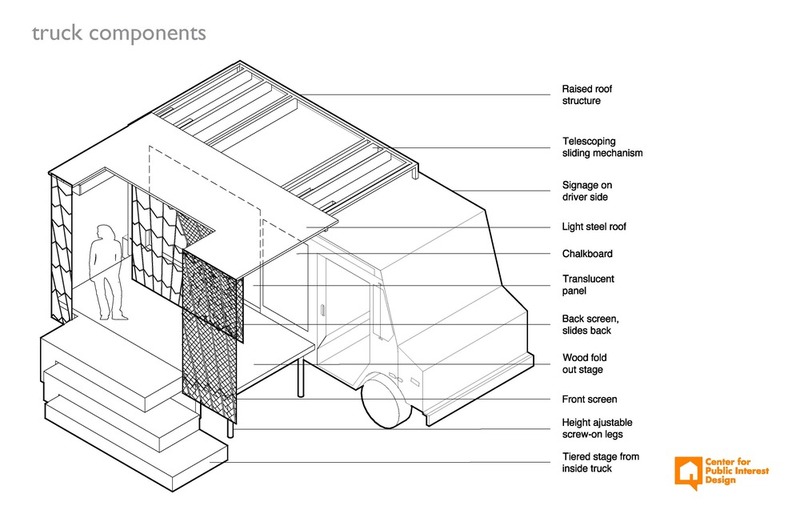 The performers were enthusiastic partners, agreeing to sing in, on, adjacent to, and in front of the truck, which allowed the design to team to understand the implications of each position on the audience relationship and pragmatic requirements. At the conclusion of one of the performances a houseless individual and his dog came up to our group to offer appreciation for the impromptu concert. The man said that he wanted to give something back in exchange and asked if he could share a joke that he wrote, which of course we obliged, leading to further discussions. While it is a minor example that falls outside of a structured exchange with a community, this man with very limited resources understood that a fun and productive relationship could be built with an exchange- you have songs, I have a jokes, let’s trade. This aspect of the research process provided crucial insight into both community perception and logistical considerations for mobile performances.